September’s median sales price took a big drop. For the prior three months (June, July and August) the Reno-Sparks’ median home sales price had held steady at $250,000, however for September the median sales price fell to $239,000 — equivalent to a 4.4 percent decrease. 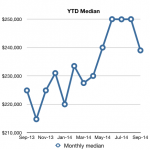 Year-over-year September’s median sales price is up 6.7 percent. Units sold in September fell 14.5 percent from August’s number — much of this decrease can be attributed to the seasonal slowdown of home sales. That being said, September’s 491 houses sold is also down 4.3 percent year-over-year. September’s median sold price per square foot (ppsf) dropped to $136.71/sq.ft. — a decrease of 1.2 percent from August’s median sold ppsf of $138.38. Year-over-year September’s median sold ppsf is up 8 percent. September’s median days on market (DOM) came in at 71 days — adding a whopping 11 days to August’s median DOM of 60. However, this increase may also have a seasonal component to it as we saw a similar jump in DOM last year at this time. Available inventory fell a bit, and remains at a “Seller’s market” level at the lower price points. Currently, 1,325 houses are available for sale — a 4.7 percent decrease from the 1,390 houses available for sale this time last month. Year-over-year, September’s inventory is up 30 percent. A whopping ten homes sold for more than $1 Million in September. That brings the total for the year, thus far, to 56 sales of $1M+ homes. At this time last year, the Reno-Sparks market had seen 43 sales of $1M and above homes. At the current rate of sales, 2014 looks to beat 2013’s 67 sales of $1M and above homes. September’s median sold price for houses and condos combined was $225,000 — a 5 percent decrease from August’s median sold price of $236,850 for combined sales of houses and condos. This entry was posted in Agent Insights, Market Trends and tagged inventory, median days on market, median home price, median sales price. Bookmark the permalink. So the median price of a house in Reno today is down 35% from January of 2006. In real terms, adjusting for inflation, the median price of a house in Reno is down about 65% from January of 2006. Housing in Reno has been one hell of an investment, hasn’t it? i just sold a property for $57k more than I paid in 2009. Another property i bought in 2010 at auction is conservtively valued 40k more that caps out at 9%/year.